Former Director of Corporate Social Responsibility, Marriott Thailand Business Council, Sean Panton. However, prior to this, Sean Panton spent many a year playing and teaching tennis at various locations around the world. 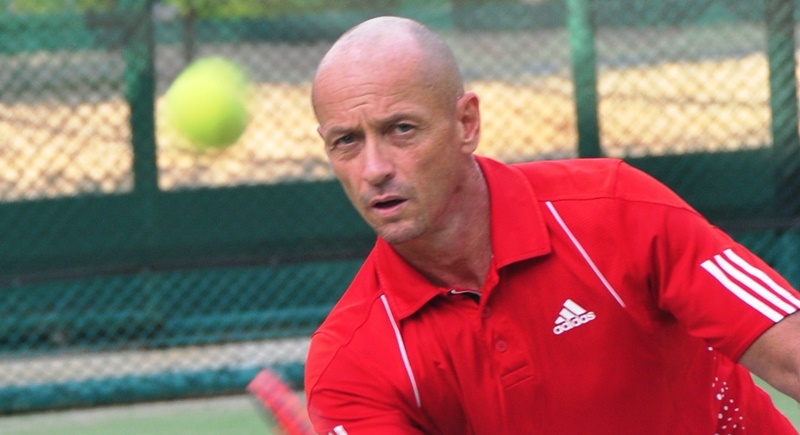 And now Panton is going back to his roots so to speak as he takes up the position of Director of Tennis at the Outrigger Laguna Phuket Beach Resort, a position which he says he is very excited to be taking up. “To be honest I am very excited about getting back on court, back to basics. “I started coaching 23 years ago and have not been full time on court for 12 years. I realised recently when my mum and family were here on holiday that I needed to make a major change in my life, and that I needed to go back to my roots and complete the circle,” Panton explained in a recent interview with The Phuket News. “I love the community work we have undertaken with SEEK and Marriott in recent years, but it takes up a lot of energy doing it on a national level so it is time for me to recharge my batteries and most importantly reconnect with the old Sean again,” he said. Talking about his tennis background, Panton said that his Dad always taught tennis in his spare time in Africa and other locations where we used to lived. “He used to teach local children for free every weekend and taught me since I was a small boy. Then when I was 12 my tennis career really started in Bahrain with a Peter Burwash International Tennis Director who noticed my talent. Soon I was training with the national team and then went to Hawaii three times to play the junior circuit and learn international tournament play,” he said. “At 15 I attended the Nick Bolletteiri Tennis Academy in Florida for a summer session and while there I won an elite players scholarship from Nick himself. I stayed there for two years training in the elite team with the likes of Agassi, Courier and Monica Seles until I had an bad injury and had to return to London. “At 22 I achieved my dream which was to join and work for Peter Burwash International, one of the world’s leading tennis management companies. My first site was in Macau where I directed the tennis program at the Hyatt. I was national wheelchair and junior development coach and while there won the Macau Open and PBI Rookie of the Year Award, some of the fondest memories I have of tennis. “I then moved to The Four Seasons Chiang Mai where the tennis included coaching the Chiang Mai Junior team and wheelchair players again, as well as hotel guests. “While in Chiang Mai I was fortunate enough to win the coveted 1998 PBI Pro of the Year Award from Peter Burwash. “In 1999 I went to open the Sports and Leisure Club at the Marriott Pattaya as the GM and Director of Tennis followed by moving to Phuket back in 2001 to open the JW Marriott Phuket Resort & Spa as the Director of Tennis and Recreation. “I then went with Marriott to the Marriott Mallorca to be the Spa and Recreation Director where I lived for two years. Thanyapura was next, where I worked as GM for two years and helped design and build the facility and team,” he added. Turning his attention to his now position at Outrigger, Panton explained, “Being trained by PBI as a tennis specialist has given me a unique scope to the job, and there is so much we can do at such a great facility like the Outrigger. “I will be involved with everything from marketing and teaching to hosting tournaments, clinics, social programming, corporate events, ladies mornings, junior development programs, men’s elite trainings, strategy, match play and video drone analysis. Whatever it takes to get the program to be the best. “The resort has a wonderful tennis facility and I look forward to building on what has already been a successful program developed over the last four years,” he said. When asked whether there was anything he had learned from his time involved with CSR that he would be able to bring to the new role, Panton said that empathy is a powerful motivator, and that he always used tennis to give back to others and that’s where his CSR background started. But what did he see as being the biggest challenge in his new role at Outrigger? And what does he hope to achieve in his new role? “I want to work with the Outrigger team to make the Outrigger Phuket Tennis Club a social hub for tennis in Phuket and an excellent tennis centre offering a full scope of tennis opportunities and programs to residents and people visiting Phuket. “Tennis is for life, and I really want to develop a ‘buzz’ around the lovely tennis facility at the hotel,” he said.